Chicken and dumplings is one of my family’s favorite meals. It’s very easy and without much added cost can be stretched to feed a whole lot of people. My two year old nephew LOVES them; in fact it was his first birthday dinner. Chicken. I used about half a dozen tenders because we like a more dumpling heavy version. Well at least I do and I’m the cook. Chicken broth or water and bouillon cubes. 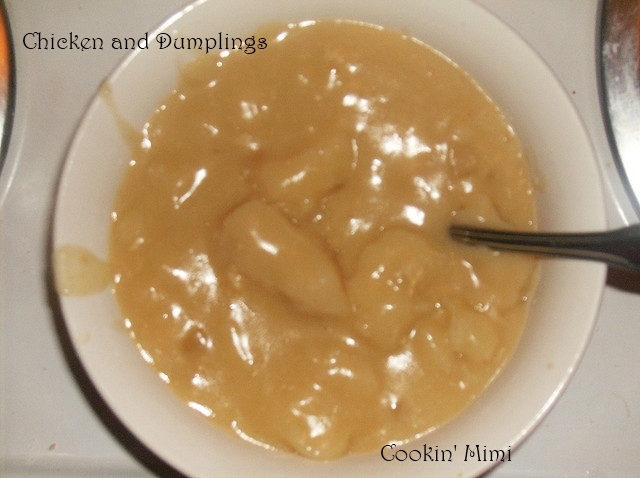 One to two quarts depending on what consistency you like and how many dumplings you make. In a six quart slow cooker combine chicken, broth, soup and onion. Cover and cook on low six to eight hours or on high for four to six depending on amount of chicken used and if it was boneless or with bones. About an hour before you are ready to eat turn slow cooker to high and remove chicken. Mix together baking mix and milk called for on the box. Place about a cup of flour in a bowl. Drop spoonfuls of the dough into the flour and place coated dumplings in the hot broth. Cover and cook on high for an hour or until dumplings are cooked through. Shred chicken and place back in the slow cooker stirring to combine. Season your serving with salt and pepper to taste. Enjoy! This sounds delicious. I so try to keep our meals “healthy” I’ll bet with reduced calorie soup and a healthy baking mix I could make this come out great. Wow…thanks for sharing. I’d have to ask Mama to be sure but I think when I was little she just used self-rising flour and water or milk for dumplings. Sounds really good! I’ve actually *never* had chicken & dumplings, believe it or not! This sounds wonderful! We love chicken and dumplings! It’s a favorite. I have never made it in the crock pot, but looks like I’ll be trying it soon. Thank you!